I am a Schaeffer Fellow because I am passionate about public service and government work. This internship was exactly what I needed to get valuable insight on what I can contribute to my community. I eventually want to return to the Coachella Valley and give back in any way that I can. I am a Schaeffer Fellow because because I aim to make a difference through policy work. During my internship I witnessed how policies intersect with social equity and how they have a ripple effect across communities and individuals. This experience has validated my passion for policy and health equity. I hope to take the skills and knowledge I gained through my internship and apply them to my aspiring career goals. I am a Schaeffer Fellow because I want to make a positive change in my own community’s public health challenges. Local governments, such as the City of Richmond, are at the forefront of collaborating with grassroots community efforts to advocate for and improve our own community’s built environment. By working with local government officials in partnership with community organizations through cross-sector collaboration we can minimize health inequities through targeted and communally agreed upon improvements to our city. I am a Schaeffer Fellow because I see the disconnects and inefficiencies between our government and our healthcare industry. I also firmly believe in the power of technology and information and aim to leverage them to bridge the gap between healthcare and government. I am a Schaeffer Fellow because I hope to pursue a career in health policy and health services research. Ultimately I would like to work in the federal government to elicit systems change by working on health insurance policy and help advocate for better medical care access for underserved communities. My internship at the Alameda County Public Health Department provided me with an opportunity to work in local government and solidified my desire to pursue a career in public service. I was able to see how the theories taught in public health courses are implemented and actually put into practice within communities. The internship exposed me to a variety of programs and careers available in the public health and public service. I am excited to continue my journey as a young professional. I am a Schaeffer Fellow because I believe that health opportunities and healthy environments should be equally available to everyone. I am intrigued by the inherent role that the public sector plays in this through the creation and implementation of healthpolicies. My internship at the California Department of Public Health has allowed me to gain invaluable exposure to public service and reinforced my passion for working to improve health equity across all communities. I am a Schaeffer Fellow because I am interested in learning about the relationship between government and healthcare. It is through this understanding that I will be able to be an informed citizen and professional. Through this fellowship, I was able to gain valuable information and insight on the role local government plays in creating a more equal healthcare system. I am a Schaeffer Fellow because healthcare is more than just medicine. Healthcare is about institutions, systems, and policy. If we want to do right with the health-care system, we must tackle the problems from where they stem, and they certainly do not stem from the sick, the healthy, nor the professionals who operate within them. My experience as a fellow helped me understand how my involvement with the behavioral health department in a resource-rich city makes a difference in terms of social and health change. I am a Schaeffer Fellow because I am interested in improving the health of my community and bridging gaps in access to health care wherever they exist. The opportunity to serve the community through this internship at Alameda County Behavioral Health Care Services gave me the chance to learn about the delivery of health care from an administrative standpoint. It has helped me to understand the importance of gaining experience in policy making in addition to serving clients face-to-face. I am a Schaeffer Fellow because I want to be able to address the health disparities that affect my communities. Through being able to see how local government impacts the health of its residents, I was able to witness both the successes and limitations that occur at city-level legislation. This summer has given me the opportunity to explore different ways, not only in city legislation, in which I can best help the communities I come from. Before being a Schaeffer Fellow, I never saw the amazing work that goes on inside public health departments and my experience there seeing it in action was inspiring. Fellowship Site: Office of Congressman Ruiz, Washington, D.C. I am a Schaeffer Fellow because I hope to learn more about how policy works in general and how health policy shapes the world we live in. This internship interests me in particular because Congressman Raul Ruiz is from my hometown, the Coachella Valley, and is a prime example of someone doing something good for their community. In the same way, I hope to be of service to my constituents. He also found the balance between being a physician and putting health policy into play, which I hope to do as well. I plan on using my public health knowledge to better serve the community I work for as a general practitioner. I am a Schaeffer Fellow because I am really interested in the public sector, and I feel that being able to intern at the congressional office has allowed me to gain some valuable insight that will guide me in what I want to pursue in the near future. I am interested and invested in my community and would like to essentially come back to the Coachella Valley to implement policies that go hand-in-hand with education and foster youth. With the help of this internship and the exposure I am fortunate to get from the Office of Congressman Raul Ruiz, I hope to expand my career choices and become a more active member within my community. I am a Schaeffer Fellow because I am interested in working at the intersection of government and health policy. I want to develop the public sector's capacity for public health since public health outcomes are determined by critical policy decisions. I would like to affect systems level change through public service in order to contribute to overall community well-being. I am a Schaeffer Fellow because I hope to pursue a career that intersects public policy and social work, addressing health disparities and public health issues that disproportionately affect low-income communities of color. I believe this internship will give me invaluable experience and insight into the intricate and complex aspects of eliciting change within public health and public policy. I am a Schaeffer Fellow because I want to futher my experience and career prospects, as I aspire to have a career in public service and law. I am excited to return to the Coachella Valley and serve my community. I am a Schaeffer Fellow because I want to be able to one day work in both a clinical and a policy-level setting so I can work to address both upstream and downstream causes of health inequities. My internship at the California Department of Health Care Services is setting me on the right path as it is allowing me to address obesity rates in lower-income women which is exactly the kind of thing I hope to do with my career: empower marginalized communities through better health. I am a Schaeffer Fellow because I hope to gain valuable work experience and exposure at the county level health sector to promote positive change by addressing health inequities. A recent Berkeley graduate with a degree in Public Health, I hope to continue my studies by obtaining my MPH with an emphasis in Global Health to address public health issues that affect the mass majority. I am a Schaeffer Fellow because I see a future in public service for myself, as I greatly enjoy working on macro-level issues that touch the lives of many. I seek to expand and improve access to health coverage in the state and trust that my internship with Assemblyman Gray will only hearten my interest in public service all the while educating me about the area I come from. I am a Schaeffer Fellow because I hope to be able to work on policies that help reduce the prevalence of chronic illness that leads to early death, which is a huge public health issue. I am a Schaeffer Fellow because I aim to pursue a career in health disparities research and policy advocacy. This internship will allow me to tie together my previous experiences in federal policy, health disparities research and patient care at a county hospital. I am studying Public Health and Molecular and Cell Biology with a minor in Global Poverty & Practice, and am applying to medical/graduate school this cycle. Fellowship Site: AMCHP (Association of Maternal & Child Health Programs), Washington, D.C. I am a Schaeffer Fellow because it allows me the opportunity to pursue my passion for health and health care within the United States government. I am passionate about working in both public service and public health, and this program provides me with an unparalleled learning experience. My career goals include research and eventually crafting national health policy. I am a Schaeffer Fellow because the program allows me to tangibly engage with my interdisciplinary interests, foster new skill sets, and establish connections with government professionals while helping the local, state, or federal health agency thrive. My minors, Political Economy and Public Policy, have allowed me to think critically about the government’s role regarding health. 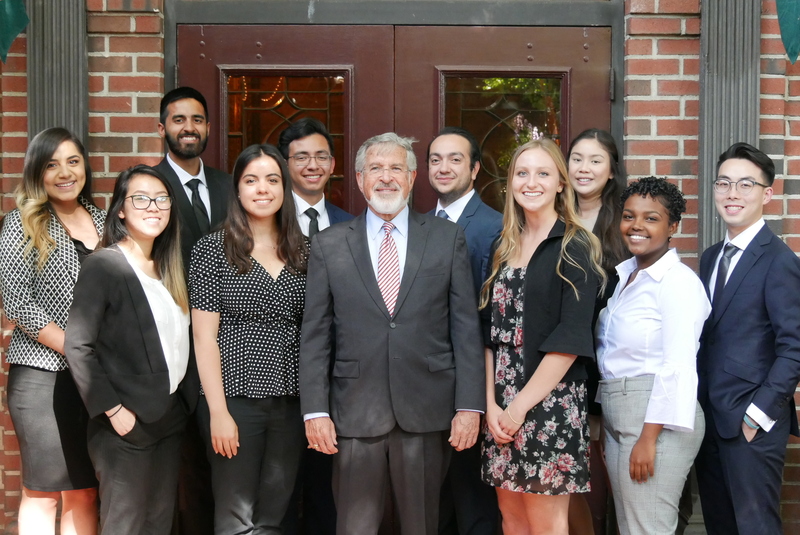 I am a Schaeffer Fellow because I want to integrate science and policymaking within the public sector, in order to advocate for the health of California’s local and statewide communities. I look forward to applying my scientific background to public health settings. I see public sector involvement as the ideal next step in my pursuit to engage with community and environmental health. I am a Schaeffer Fellow because I have a desire to learn how to fight for the public, fight for those without a voice, and fight for those without representation. I have a passion for public service and that is why I want to involve myself in health care reform. I would like to affect change in the legislative system and how it addresses health care. I am a Schaeffer Fellow because my career passion is at the intersection of health care and government policy, and this program offers a unique opportunity to serve as an effective UC Berkeley School of Public Health ambassador. Through my studies at the School of Public Health, I have taken a particular interest in health care markets, the delivery systems of health care services, and the public policy that drives healthy outcomes for our citizenry. I am a Schaeffer Fellow because I am excited to support meaningful policy work. The issues that I am most interested in are mental health (access to mental health services and resources for vulnerable populations), drug policy (from criminal justice and harm reduction for illegal substance use to the regulation of pharmaceutical firms), and human trafficking (downstream and upstream approaches to helping heal victims of commercial and sexual exploitation of children). I am a Schaeffer Fellow because I am passionate about and eager to learn about the public sector and its capabilities in helping to improve community health. Working in government is important to me because it means being able to work on legislation and programs that can help educate individuals in the community about important health matters and help effect health improvements on a broad scale. I bring innovative and creative ideas to the program to help serve the community. I am a Schaeffer Fellow because I want to address the health inequities that are present in underserved communities. So far I have only been able to play a small role in various organizations to mitigate the effects of these larger structural problems. I hope to be able to transition into a role that looks at these problems with a larger lens—a policy approach. I hope to be able to aid the policy-making process that benefits the most marginalized individuals on a structural level. I am a Schaeffer Fellow because my past research experiences piqued my interest in exploring the complexities at the intersection of public health and governmental affairs, as well as the mechanisms for influencing policy along a public health agenda. My demonstrated passion for representing minority and indigent populations, particularly as it pertains to health care accessibility and disparity of health care resources, have allowed my budding fascination in the policymaking process to manifest itself. I am a Schaeffer Fellow because I realized that public health is very much a hybrid of medicine and public service. I plan to gain direct work experience in health policy, health care administration, and program coordination through this program. In the future, I plan on obtaining a master of public health (MPH) degree with an emphasis on Health Policy and Management. My goal is to build and operate a community health clinic in my home county of San Bernardino, California.